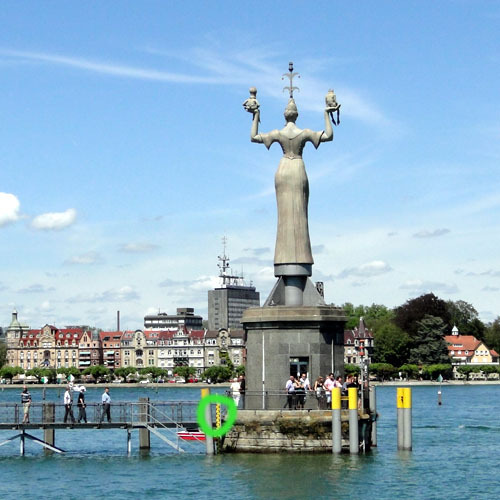 Play our photo differences game just for fun, with this image of the statue of Imperia, created in 1993 by Peter Lenk. The statue stands at the entrance to the harbour of the city of Konstanz, in the German part of Lake Constance (the ‘Bodensee’ in German; Austria and Switzerland also have part of the lake shore). The 9 metre tall statue commemorates The Council of Constance (1414 – 1418) held by Pope Martin V and the Emperor Sigismund, and caused a row when it was installed because it refers to a satire on the behaviour of Catholic clergy by Balzac. Lenk’s sculpture shows Imperia holding naked figures of the pope and emperor, one in each hand: in Balzac’s story, ‘La Belle Imperia’, she seduces cardinals and princes at the Council of Constance, so gaining power over them.